2016’s modern man squeezes a seriously broad portfolio of life-experience into a single day. We gym. We date. We work. We socialize. And thanks to technology, we do these things in a manner totally unimaginable to our forebears: we conference call during Crossfit, Tinder as we take lunch, and close deals over coffee. Work vs. life? Forget it. Today that dialectic – and the impossible quest for ‘balance’ – is old news. Whether at home or on the road, we live integrated, everything-at-once lives. And it makes them richer. But modern life comes with its own unique demands. Because we can do anything, we need to be dressed for it too. The old cast-iron categories of masculine attire have rusted into irrelevance. Dressing for dinner? For real? Clothes that are fit for purpose in 2016 need to have three key attributes; they need to be appropriate, they need to be stylish, and they need to be versatile. The last one is the clincher. Versatility. To get the most out of life we need clothes that are as versatile as we are. That’s why GQ, in partnership with Kit and Ace, has recruited three exemplary men of our time to help muster six handy guidelines to effort-free all-day dressing. So let’s get to it. Meet Rob Gregg, an always-on-his-toes footwear designer who juggles a serious gym habit with a modeling career and his own business. He cycles between meetings and casting calls, and needs to look fresh doing it. That’s why he favors classic pieces with fitted, pristine silhouettes that stretch when he does, like Kit and Ace’s Commuter Trouser, which marries the label’s technical fabrics to an impeccable fit. They’re the kind of pants that can take you from bicycle to boardroom, and keep you looking the part whether you’re sitting on a Brooks saddle or an Aeron chair. 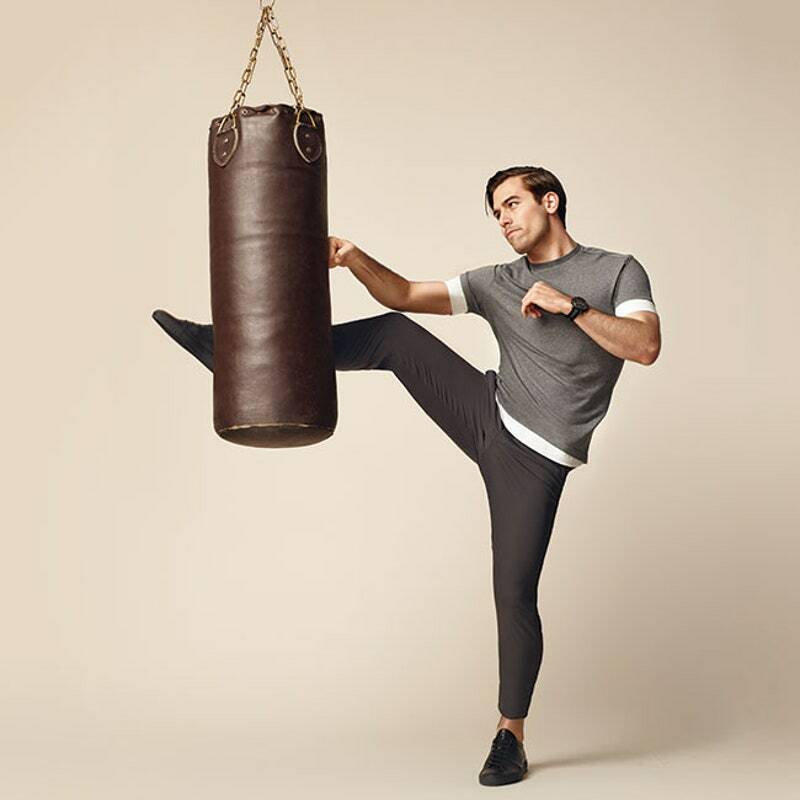 When you’re really determined to sweat – like Gregg when he’s kicking the living daylights out of that punch bag – it’s eminently more comfortable (and fragrant) if you can avoid being wet afterwards. So find all-day technical clothing built to minimize any discomfort post-workout by wicking moisture away from the body. You’ll avoid rashes, and leave the gym looking cool and unflustered enough to go straight into your next photo-shoot. For stylist Preston Konrad, a typical day begins at the neighborhood coffee shop, but it might end with an unexpected flight. Short of keeping your ID and credit card handy, the way to prepare for an unexpected day is to dress in clothes that will keep you comfortable without ever looking rumpled, even when you might be jumping in and out of cabs or on and off planes. Pieces like Kit and Ace’s Commuter Trouser and To The Nines Polo are made of wrinkle resistant fabric that’s ideal for travel, whether that means rush hour on the subway or a more far-flung journey. When Preston’s day goes from styling a shoot to pitching a TV segment uptown, he needs to take his attire from casual to smart without a full outfit change. That’s where a versatile piece like the Kit and Ace Bomber Blazer comes into play. This light-as-a feather, heavy impact mid-season hybrid looks like a jacket and wears like a bomber, meaning you can dress it up or down depending on your needs. Luke Ditella is a pro surfer turned creative brand strategist and entrepreneur. He used to chase big waves for a living – now he chases big ideas instead (while surfing on the side). When Ditella takes meetings he favors duds that reflect who he is off the clock. So he thinks nothing of wearing smartly tailored shorts straight from a surf session to a strategy meeting. A button-up adds a little formality to the mix, while keeping things easy and making it clear that he’s a multi-faceted guy, with ideas to match. Clothing for an active lifestyle needs to be functional, but it also has to serve your sartorial needs. 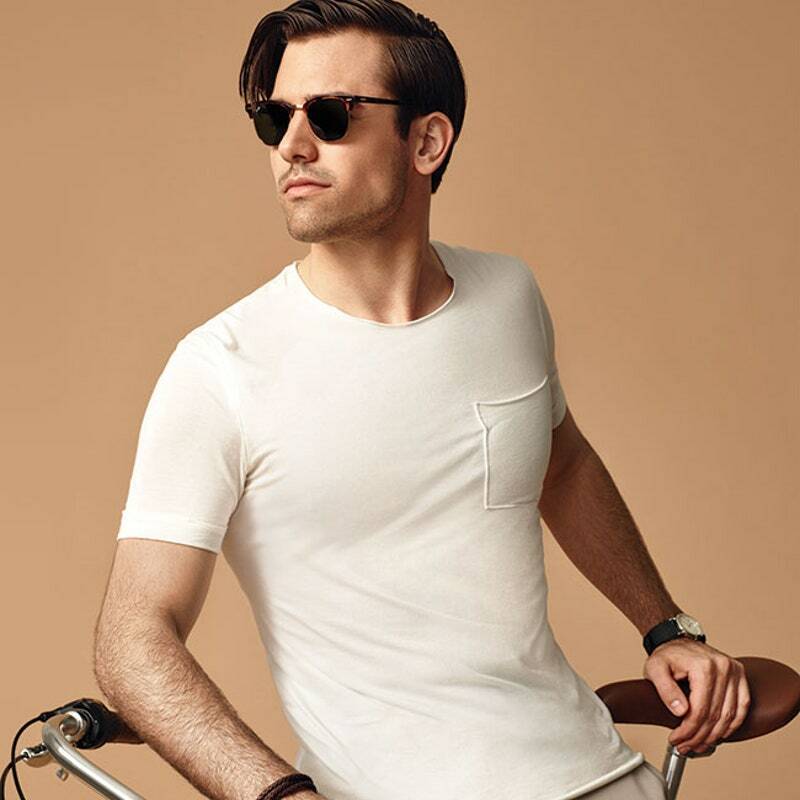 When you wear a piece like the Compare and Contrast Henley, the side seams are positioned to reduce friction as you move, but anyone you encounter will focus on the smooth look of the Technical Cashmere™ fabric and the eye-catching contrast-colored sleeves and placket. When dressing for an active day, make sure you look as good as you feel.